Robert Nadeau, Professor Emeritus at George Mason University, has attempted throughout his career to bridge the knowledge gap between what British physicist and novelist C. P. Snow termed the two-cultures of humanists-social scientists and scientists-engineers. Nadeau created and directed four academic departments and programs that specialize in interdisciplinary studies and has published ten books that deal with a wide variety of subject fields on both sides of the two-culture divide. 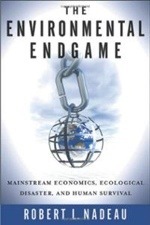 His most recently published books, The Wealth of Nature (Columbia University Press, 2003), The Environmental Endgame (Rutgers University Press, 2006), and Rebirth of the Sacred (Oxford University Press, 2013), make the case that the theory used by virtually all mainstream economists, neoclassical economics, is predicated on unscientific assumptions about the dynamics of market systems that effectively preclude the prospect of implementing scientifically viable economic solutions for environmental problems. Nadeau also founded and served as director of the Global Environmental Network Center at GMU and is now an active member of the following environmental organizations: Capital Institute www.capitalinstitute.org, Humans and Nature www.humansandnature.org, Living Economies Forum www.livingeconomies.forum.org; Institute for Public Policy www.ips-dc.org, and Global Economic Integrity Group www.globaleconomicintegrity.net. Contact Robert L. Nadeau at rnadeau@gmu.edu.